Procedures are undertaken to improve a "gummy smile", wherein the teeth appear short and too much gum tissue can be seen. Your teeth may actually be the proper length,but they are covered with too much gum tissue. 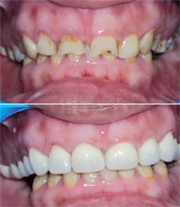 To correct this,esthetic crown lengthing is performed. The excess gum and bone tissue are reshaped to expose more of the natural tooth.this can be done to one tooth or to several teeth to expose a natural, broad smile. On the other hand,some patients may feel that they have exceptionally long teeth.this can be caused due to excessive gum recession which causes the tooth root to become exposed,thus making the teeth look long. Soft tissue grafts and other root coverage procedures can be used to cover the exposed tooth roots,to reduce further gum recession and to protect the vulnerable roots from futher decay. THE SMILE MAKEOVER PROCESS The first step in making over your smile is ensuring that your teeth and gums are healthy through a thorough dental examination. Next,impressions and models of your teeth are preaprec along with your profile pictures and dental x-rays.We'll also take into account your face shape,skin tone and other characteristics so that we can give you the perfect look.once you decide on your smile shape and the shade you want,your dental work is crafted,your teeth are prepared for the procedures and then the ceramic veneers/crowns are placed.Gum corrections if required are done before placement of the crowns.